Kyle Brunton for Hawick (stock image by Stuart Cobley). Hawick head coach George Graham says it’s vital the Greens extract something from their return to Mansfield Park tomorrow (Saturday). 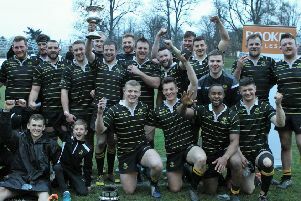 The Robbie Dyes suffered another hefty defeat last weekend, this time by Currie Chieftains, to remain at the foot of the Tennent’s Premiership and without a point from three starts. Despite the 42-7 reversal, there were many promising signs from the Hawick performance, with some good form in the first half allowing them to take the lead. However, the Greens failed to keep up the momentum after the interval and the Malleny Park hosts hit a comfortable stride to win the game convincingly in the end. “It was quite encouraging but there were the same problems with the defence,” admmitted Graham. Graham added: “I thought our commitment, accuracy and attention in the tackle area was so much better, but not good enough. “There was only a standard defence that stopped them scoring a couple of tries. Graham said Hawick had played well but needed to commit more to the breakdown. “They were putting a lot of pressure on us, making us put more people in,” he added. Graham said he could not fault the players for their commitment in training and they had to make sure the hard work came to fruition when they were on the field. “I would expect another reaction this weekend,” he added. “It’s a huge, huge game for us because we are at home and we are against one of the other clubs – Glasgow Hawks – that is not in the Super 6 as well. Despite the result last Saturday, Graham said he may largely keep faith with the side that tucked in to Currie, as there were a few encouraging indications. “We are finding a wee bit of consistency with players,” he said. “The team we had at the weekend was pretty much as good as we have played so far, so we’ll maybe tweak that a little bit for the weekend.